The owner of this project is an Independent Broker Dealer whose principals attended a local USGBC chapter training class in green buildings back in 2012. 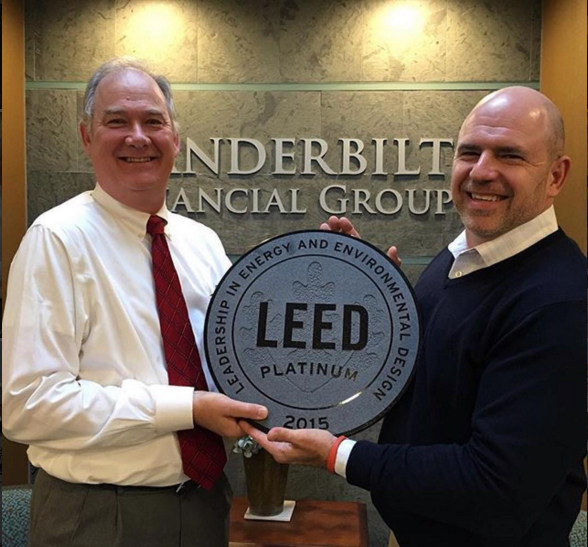 Shortly after that they purchased an existing building with the goal of creating a green and sustainable workplace for their staff to move into. Electric car charging stations were installed and the owners have also made them available to their neighbors. The stations were funded in part by a NYSERDA grant which offset 85% of the direct material cost. Low flow fixtures were used throughout the building resulting in all four LEED WE points. The building features a 96.5kW rooftop solar system. A high-efficiency SunPower system was chosen to offset the greatest amount of energy. The system, which consists of 295 327-watt panels and 4 SMA inverters, is expected to produce 119,482 kWh annually. Over the course of the year, the system will offset 90% of the building’s total electric requirements by cost. The owner received a utility rebate of $42,480 and will file for a federal tax credit of $89,351. The combined incentives offset about a third of the gross cost of the system. The owner received a utility incentive for the PV system to offset some of the cost. The building operates 78% below the ASHRAE 90.1-2007 baseline case and received 19 points for EAc1 plus and ID point plus a Regional point. All existing T12 fluorescent lights were replaced with LED and all roof top HVAC units were replaced with high efficiency units for which the owner received another utility incentive to offset some of the cost. The utility company also supplied rebates for energy modeling costs, commissioning services and for achieving LEED energy related credits. All existing interior walls were reused in the new design as well as some millwork, doors, carpeting, and ceiling tiles. The result was a LEED Platinum certification.